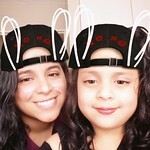 Hi, it's me again.... :) it's been a long time since my last post, still with no free time. Just wanted to share with you all pics of two of my finished project that were framed in the past couple of weeks: African woman which I finished in 2005 while living in Barcelona and Rune Gypsy finished earlier this year. Both are now hanging on my living room. The pics don't do them justice at all. While I was picking them up at the framer's two ladies didn't believe they were stitched they thought they were paintings...LOL...they even put on their glasses to have a better look. 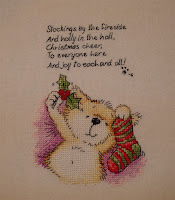 I finished stitching Wordsworth's Christmas Cheer on Friday, I really enjoyed this project and even liked to do the backstitch. 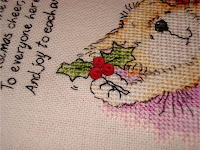 It's done on linen using Anchor threads, and added three small buttons as hollyberries. This is the second Wordsworth I've stitched (here is a pic of the first one) , the first one was a birthday gift for my daddy and this one is a new addition to his small collection hehe . 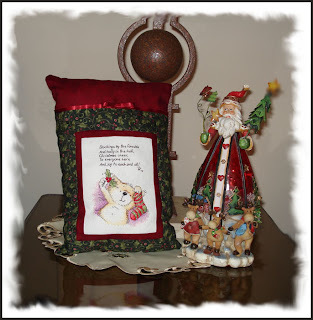 I didn't want to frame it, but wasn't sure how t0 finish it, finally I decided I was going to finish it as a pillow. The previous pillow I'd made was hand-sewed this time I did it with a sewing machine...I had no idea how to use it and it took me all Sunday afternoon to finish it...but final result looks OK not as great as I had imagined. Maybe I'll do better next time. 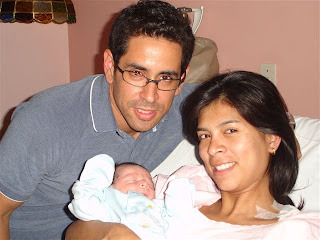 Today my brother and his wife welcomed their first child, Joaquin . 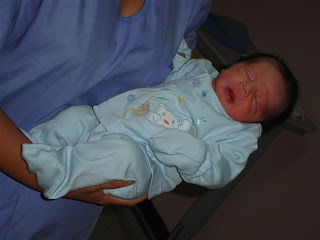 He was born by c-section at 8.10 am and weighted 2800 grs. He's so tiny and cute...now we're trying to figure out if he looks like his daddy or mommy. He is the first baby for both families so everybody is really excited, including the new aunties of course . On Sunday night I finished "Gabriela" . I wasn't sure where and how to stitch the birth date , so finally I decided to keep it simply and just backstitch it. I added a little bee that I had in my stash, I think it looks cute. 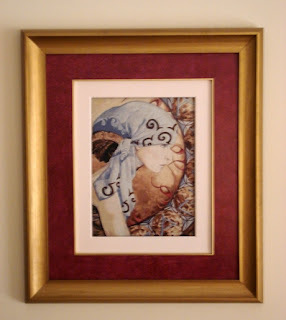 I'm very pleased with the way it turned out and the framer liked it too...so we're both happy! E.T.A. Si Nela, el español es mi lengua materna. Y la abejita es una aplicación que tenía entre mis cosas y que se supone es para scrapbook; yo decidí usarlo aquí y lo pegue con silicona caliente. 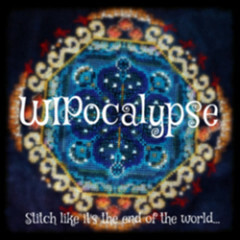 So like Carla has told you, I've had little or no free time for stitching. After almost a month it seems like I've made very little progress. This is my progress on the name sign...after I posted the previous pic I notice that the letter G was not in the right position so I had to "frog" the whole letter ... oh well I think everything is Ok now. I had to scan it this time, so the colors are all not as how you see them IRL. I think I'll finish it by the end of the week and on Monday I'll work again on Wordsworth - Christmas Cheers. For those who are wondering, Carol is still stitching on the afghan. She has very little free time so she only works on it on Sundays. 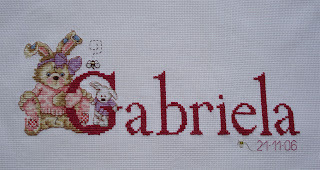 This is my weekend progress on "Gabriela", a name sign I'm stitching for my framer's newborn niece. The color of letters was chosen by her to match those of the baby's bedroom. What’s left to stitch is a little bunny, in the original design the bunny was holding the letter "Q" but I adapted it to hold the "G". How do you secure your thread when you begin a new one? Specifically, do you or have you ever used a waste knot?